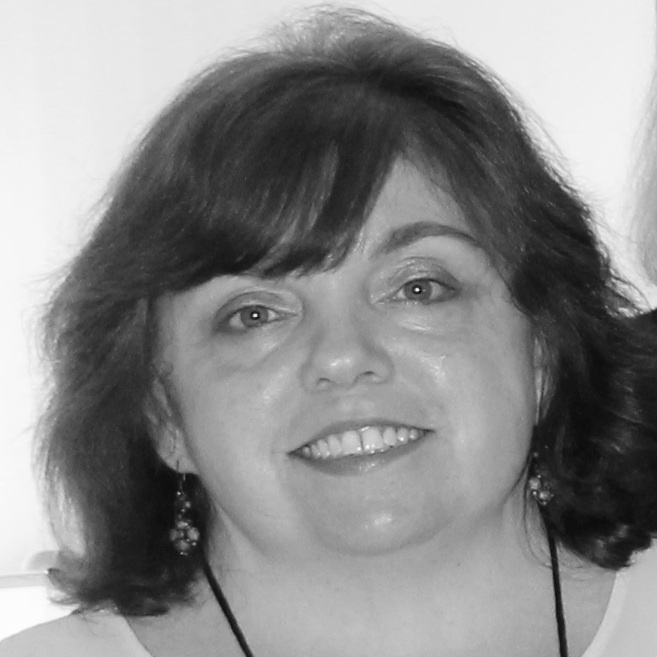 I originally wrote about this on my SherryHarrisauthor.com website a couple of years ago. But I was dusting today and thought maybe you all would like this story too. 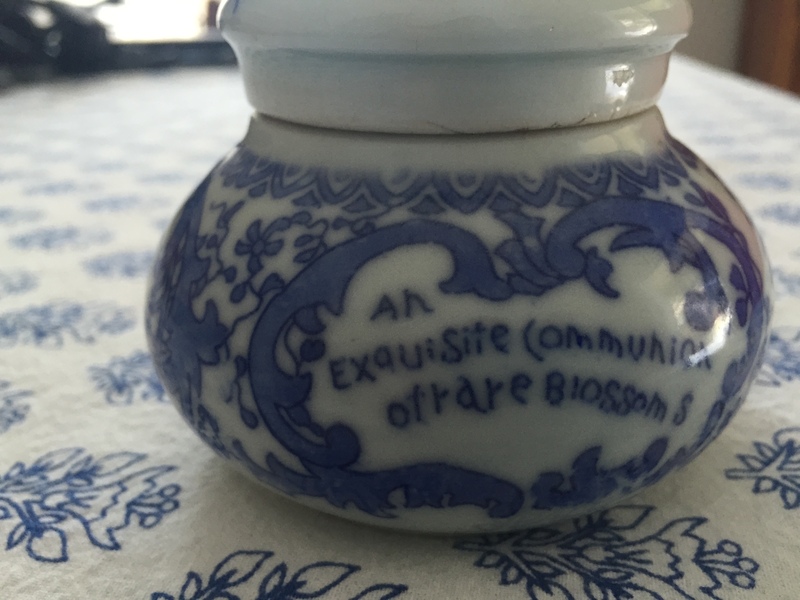 One day when I was wandering around an antique store in Concord, Massachusetts I found the beautiful little jar below. 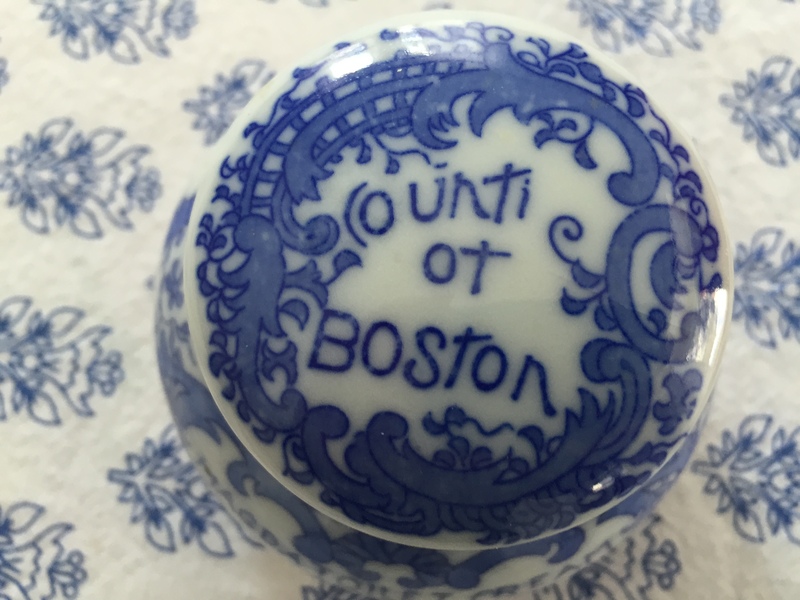 I loved it for two reasons — it was blue and white and it said Boston on it. I knew I would live in the area forever and thought it would be a wonderful keepsake. 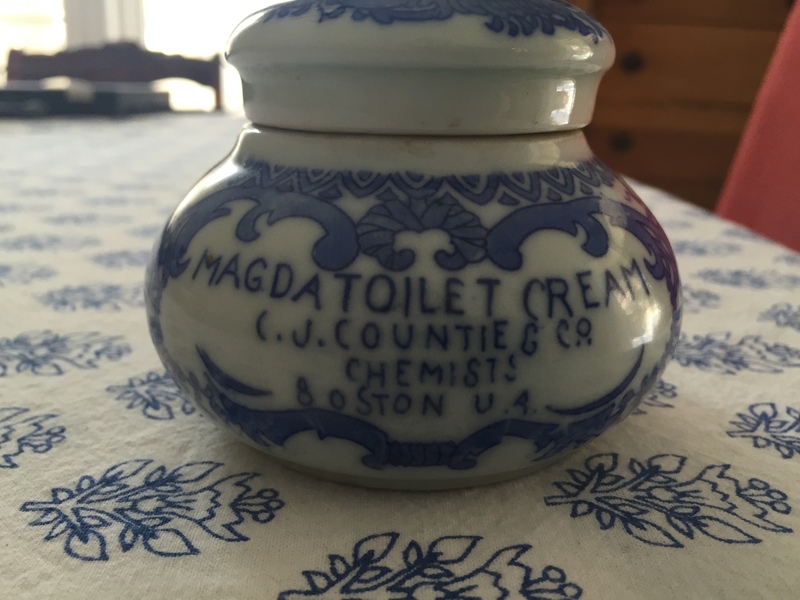 This side of the jar reads: MAGDA TOILET CREAM, C.J. Countie G CR, CHEMISTS, BOSTON, U.A. — other jars say USA but the S on mine has disappeared. I’ve done some more research since I wrote the first post. The National Museum of American History has one, but it’s not currently on display. Click here for the link. There are two for sale on Esty. Both are around $150.00. Most sites date these from the mid to late 1800s to the early 1900s. Readers: What small thing do you have that you treasure? I love that jar, Sherry! I own several old pieces that come from my grandparents’ farm. A mantle clock that no longer runs. A stoneware crock that I remember was under the basement steps and covered in cobwebs. A blue and white plate. A cow and bucket creamer and sugar bowl set. All things I remember from my childhood and managed to snag for myself when the farm was sold. And all things that I treasure deeply. Oh, those sound like wonderful treasures!. I have a mantle clock from my grandparent’s farm that doesn’t work, too. What a sweet little jar and excellent find, Sherry! The second floor antique shop near Concord Lamp and the cheese shop on Walden Street? I love that you did the research on the pot – well done! Nesting is one of my favorite shops in Concord! I own several things from there. When I live in Bedford there were two other shops on a side street off Main Street. I think i bought the jar at one of them. Go have breakfast at Helens for me. It was our favorite. That’s very cool you did the research, Sherry. 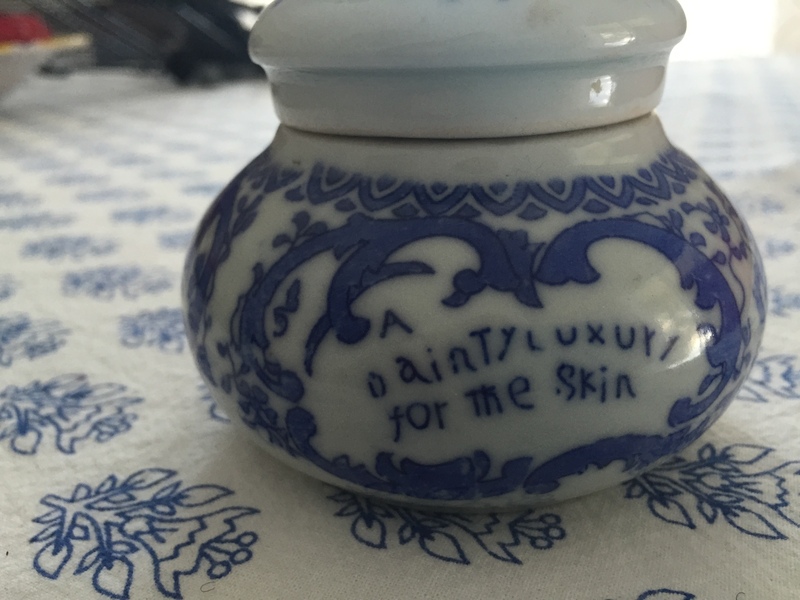 I have a porcelain jar with a lid that I think is an apothecary jar. It’s nearly a foot tall and my grandparents had several of them. I just tried to do a bit of research and struck out! Must persevere. It has a portrait of Hippocrates on it and the words (medical abbreviations?) FOL: COCHL: under his picture, plus a bunch of ornate gilt. I don’t keep anything in it but I love having it..
That sounds like a fantastic jar — how interesting! Loved this, Sherry! I buy (on impulse) and toss moisturizers, etc. on a regular basis because none of them seems to work that well for me. Maybe if they came in a pretty jar like this I’d think twice about investing in all those new products. Or at least I’d have something whimsical to keep! I had a lady who had tried all kinds and prices of moisturizers suggest Fruit of the Earth Vitamin E Skin Care Cream…I love it because it doesn’t make me break out. I also love their Aloe cooling cream and lotion for the hot summer days. I’m going to look for that, Gram! Thank you! You really got a bargain!! I think I’d buy a second one too. I’m always leery of monetary value of things on Facebook. Especially when prices vary so widely. I’m sure there is some middle ground. What a cute jar and a great story! I collect antique powder compacts. Some of them absolutely lovely and some are touristy. I love them all, but I think my favorite is a green enamel one with green (emerald like) stones on top. It was very impractical, but so pretty! My mom had some cool powder compacts from the 1950s. But she tossed them when she moved. The green one sounds amazing! I treasure a small straw man a d basket that was given me by a Mexican artisan because I have him an idea for a piece of work. It is better and falling apart but I remember the incident. That is really interesting, Betty! It must be amazing. What a great find! I don’t have anything like that in my collections. Thank you! But you have some cool collections! What a neat find. I like the story behind it. I loved finding out about it! I love the story and the jar! I have several old powder containers, including the power puffs from my great aunt, great grandmother and my grandmother, along with other special sweet things from them, including jewelry,embroideries, tatting’s.aprons, cookbooks etc. I collect all kinds of old things. Those sounds like wonderful treasures. I haven’t thought about powder puffs for years. I have some things my grandmothers embroider and tatted too. I do find most people really do not think of the powder puffs..lol, but gosh I love them!